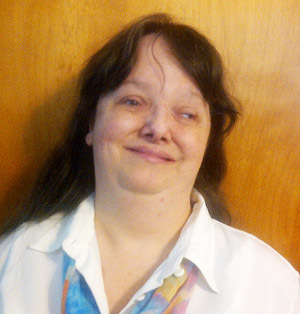 Amy E. Hasbrouck has been a disability rights activist for more than 30 years. Ms. Hasbrouck’s activism combines her personal experience with congenital and acquired disability with a cross-oppression analysis gained through involvement in the women’s rights, anti-war, LGBT, and other social justice movements. She worked in architectural access and the independent living before graduating from Northeastern University School of Law in 1997. Her subsequent legal work focused on health and mental health law and implementation of the Americans with Disabilities Act. Ms. Hasbrouck has focused her writing and research skills on abuse of children and adults with disabilities, producing a groundbreaking report on prosecution and sentencing of parents who kill their disabled children in 1997. This study led to her involvement with Not Dead Yet, the disability rights-based opposition to assisted suicide, euthanasia, and other end-of-life practices that discriminate against people with disabilities which continues to this day. Ms. Hasbrouck has been a board member of Not Dead Yet in the U.S. since 2000. She has had several articles and op-eds published in newspapers in Canada and elsewhere. She is currently Director of Toujours Vivant-Not Dead Yet, a project of the Council of Canadians with Disabilities to expand the reach of CCD’s ending of life ethics committee. She lives with her husband, dog and two cats in Québec, Canada. You can reach Amy at amy.hasbrouck@tv-ndy.ca.